I just love this time of year! 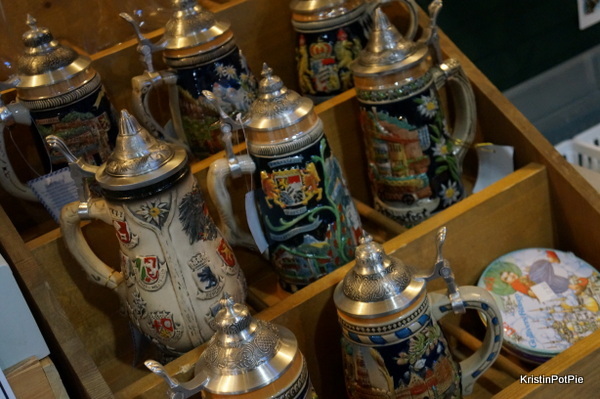 With our German heritage, my family and I enjoy celebrating Oktoberfest each and every fall. 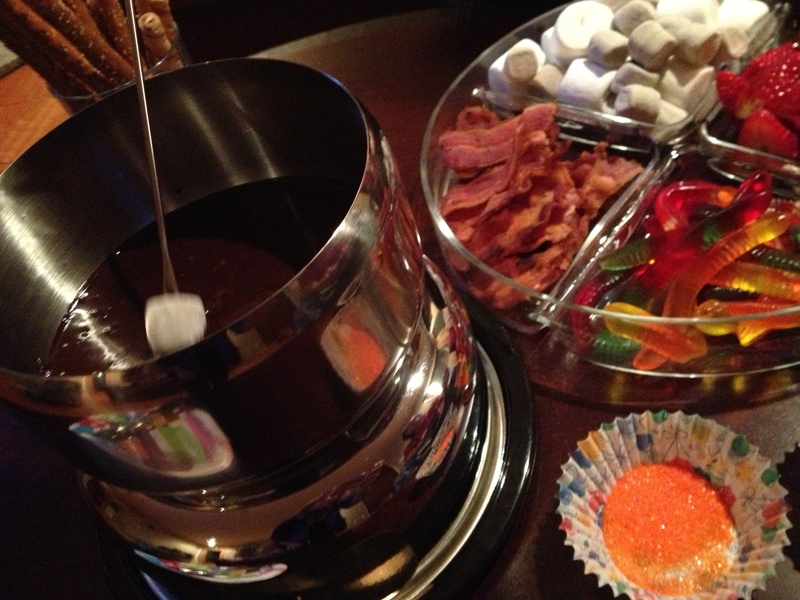 Some years that means hosting a gathering at our house (here are some ideas for hosting your own! ), some years we just make a special intimate dinner with a smaller crowd (serving this authentic rouladen recipe!) and some years we make the trek to Leavenworth for their big multi-weekend event. But last year we decided to try something different. Longing to enjoy a big to-do, but not really wanting to expense a whole weekend east of the mountains (it gets pricey with a two-night minimum stay on festival weekends), we checked out the festivities at Oktoberfest Northwest held at the Washington State Fair & Event Center in Puyallup, WA. This weekend marks the 10th anniversary of this fun indoor event and I hope you will join me in the revelry! 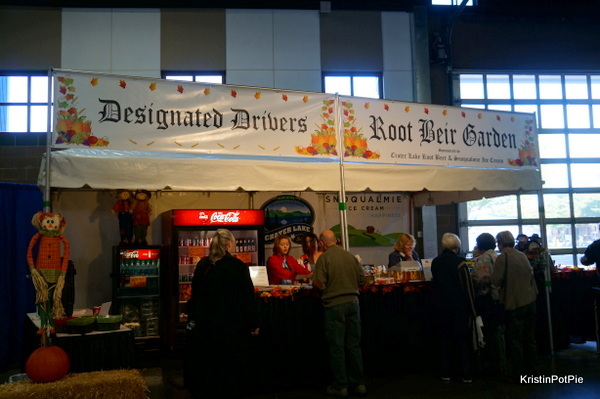 The biergarten certainly is impressive, but to keep us all safe please be smart about your transportation plan – there are free soft drinks or drip coffee for those who sign up as a designated driver. 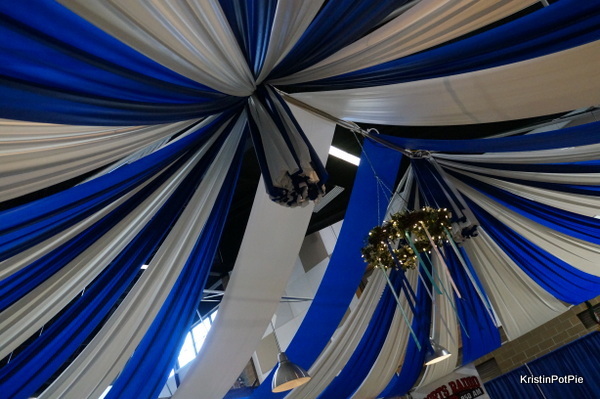 Families are welcome in the Festhalle Biergarten until 7 p.m. each evening (Sunday, families are welcome all day! ); for the remainder of the evening, guests must be 21 years of age or older. And there are plenty of activities for the whole family! 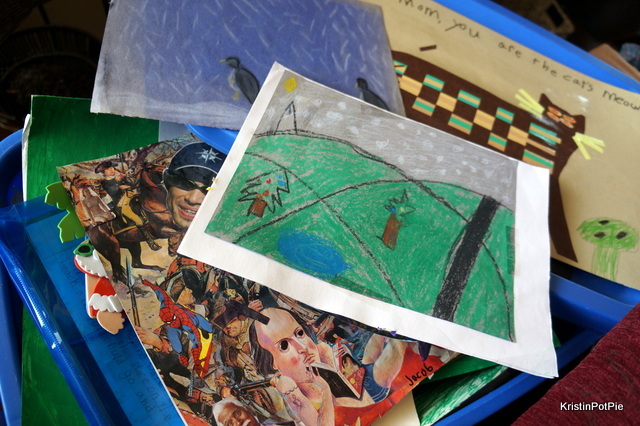 The German School of Tacoma will be on site with special arts and crafts projects. 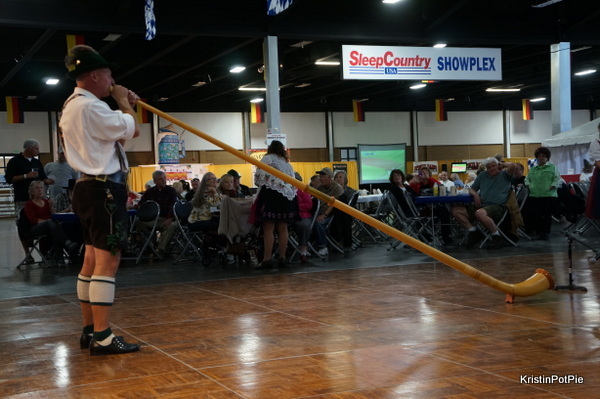 Kids won’t want to miss the opportunity to take part in an authentic May Pole dance with members of the Enzian Schuhplattler Dancers, pumpkin decorating and games like Corn Hole Toss and more. On Saturday and Sunday only there will also be free face painting and an ALL-NEW Scavenger Hunt with a fun prize for every child who participates while supplies last. 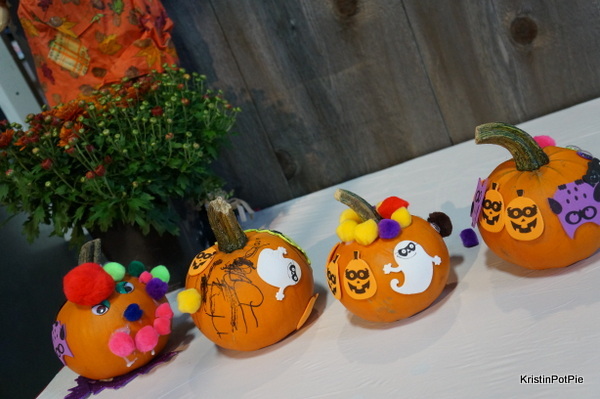 Kids can pick up their Scavenger Hunt instructions at the Root Bier Garden between noon and 6 p.m. Saturday and Sunday. 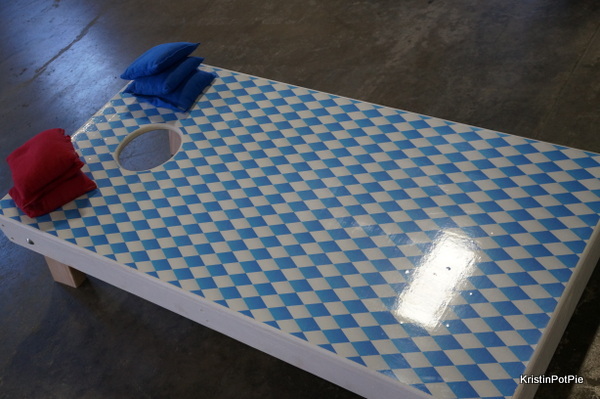 The game, Hammerschlagen, is a popular activity at Oktoberfest. The goal is to drive a nail into a cross-section of wood faster than your opponent. 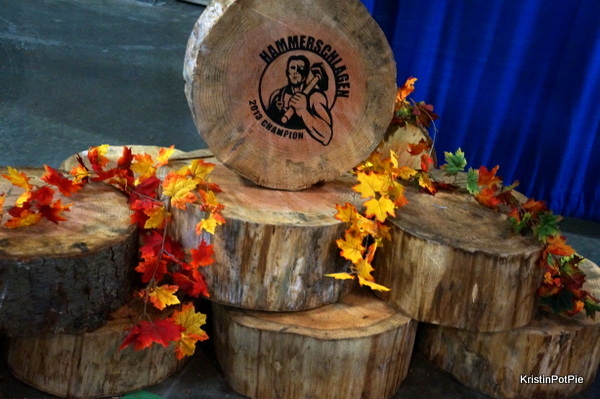 Each year the Best of the Best compete for a space in the Hammerschlagen Tournament of Champions Wall of Champions. Who will be champion in 2014? Could it be you? Sign up on site at the event for your chance at bragging rights, glory, and a whole mess of great prizes. 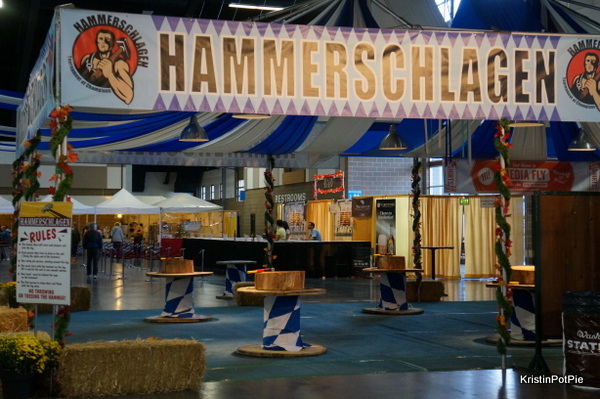 Children are encouraged to not play Hammerschlagen in the adult area for safety reasons. 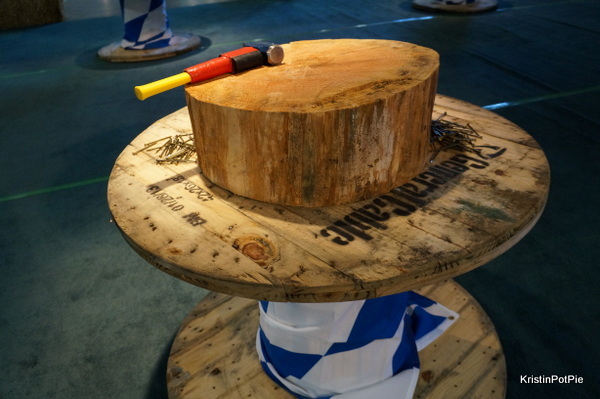 There is a Kids Hammerschlagen with kid-sized hammers and easy to hit nails (children need to be supervised by an adult to play)! 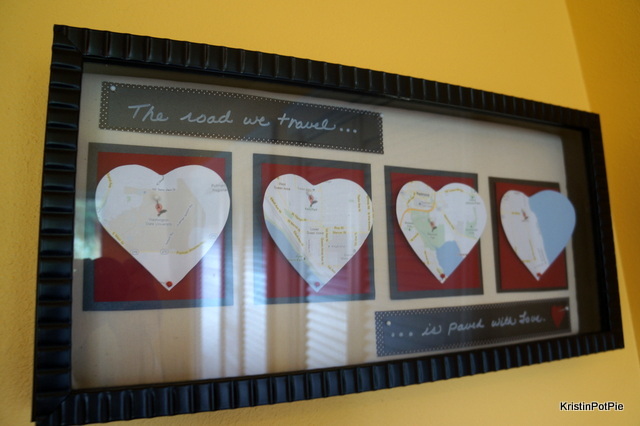 Find that perfect gift for someone (or yourself!) 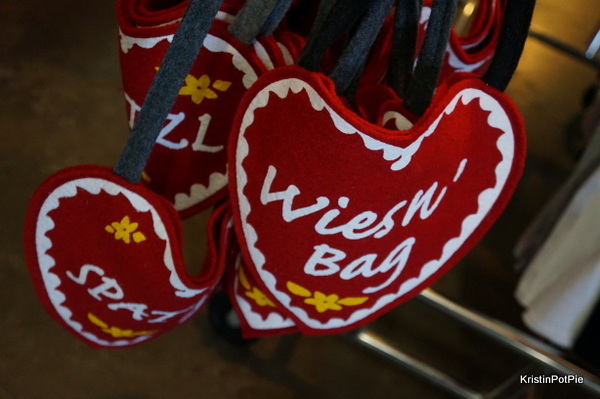 while wandering among all of the great souvenirs at the German Corner. I plan on buying one of these cute little purses this year! I do hope they have them again! 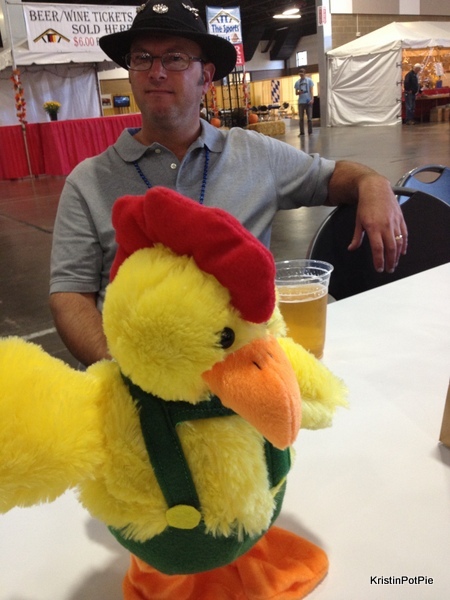 Entertainment at Oktoberfest Northwest keeps the party going all day long and late into the night! 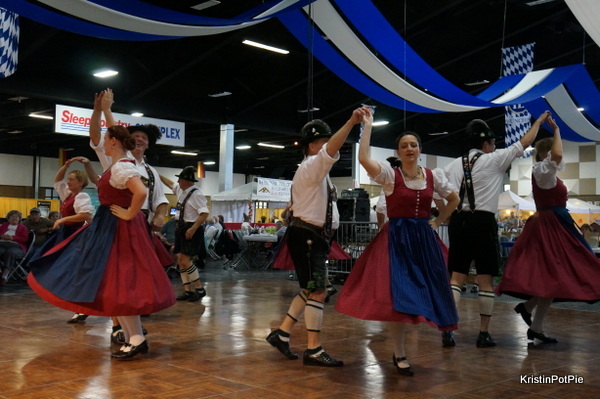 Whether you’re looking to sway to the sounds of Edelweiss, get plucky with the Chicken Dance or hit the dance floor to the late hours of the night, Oktoberfest Northwest has it all! 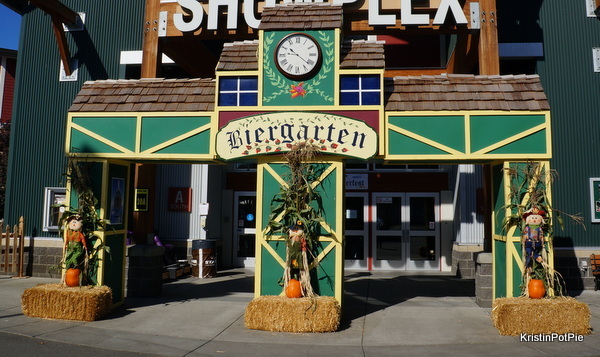 On Friday, October 3, at 6:15pm join in the fun as they tap the Oktoberfest Firkin to officially open Oktoberfest Northwest! And don’t miss the swing girl! 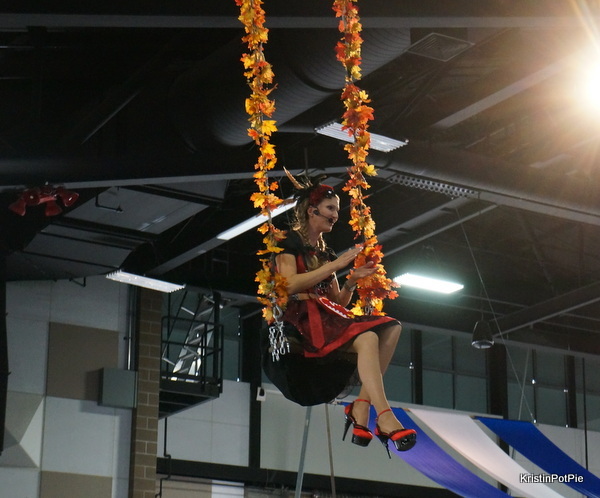 Manuela Horn & her Oktoburlesques! At nearly seven feet tall, this Austrian Amazon will perform yodelicious interpretations of new & classic Top 40 hits. Manuela is the Queen of Oktoberfest. 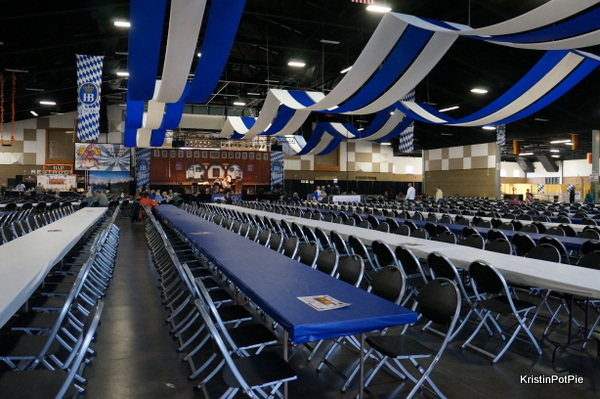 With the motto “It’s always Oktoberfest somewhere,” Manuela emcees and headlines the biggest Oktoberfests across America. Oh! 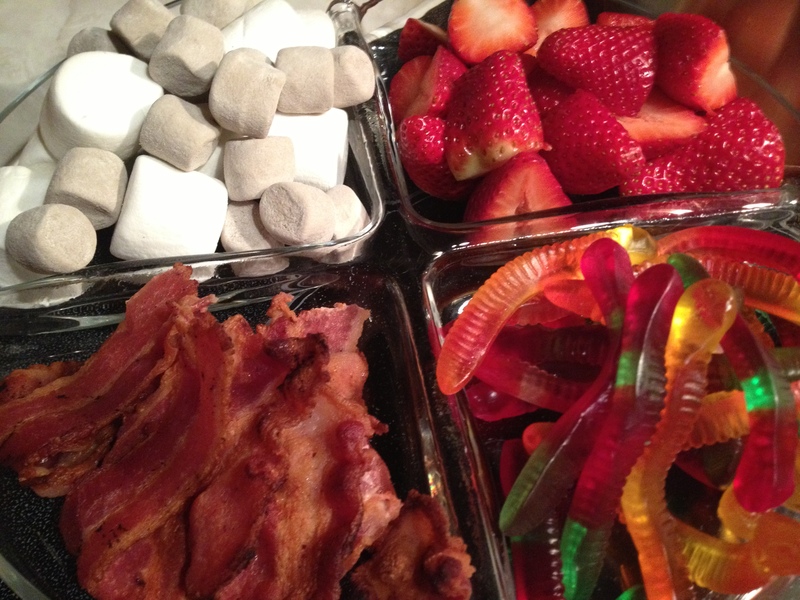 And the FOOD! My goodness! You want brats and beer? You’ve got it. 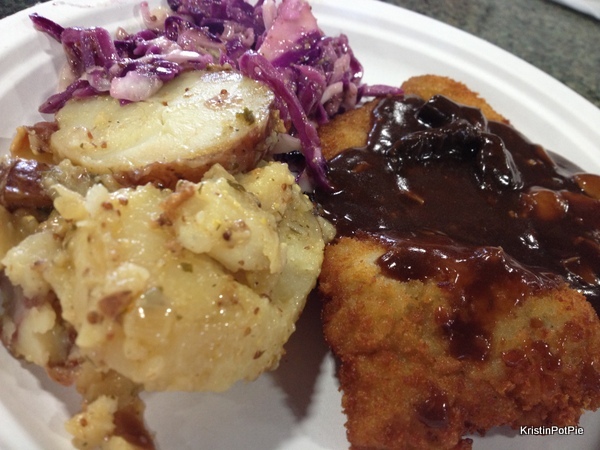 Plus pretzels, schnitzel, strudel, and a whole list of other authentic German treats! 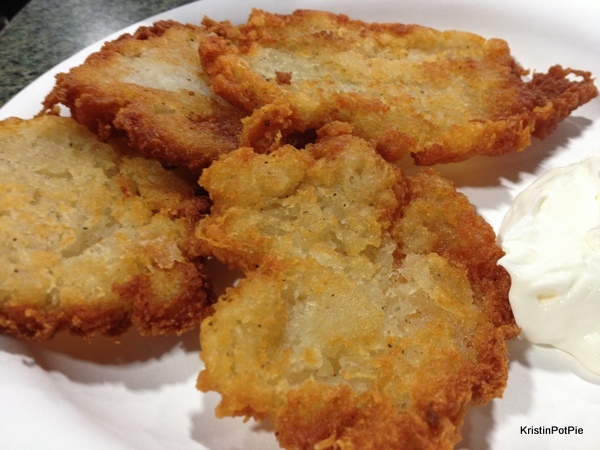 Like the tasty Cabbage Rous (Kraut Roulden) in tomato sauce, and the Kartoffelpuffer (potato pancake) served with apple sauce and sour cream! 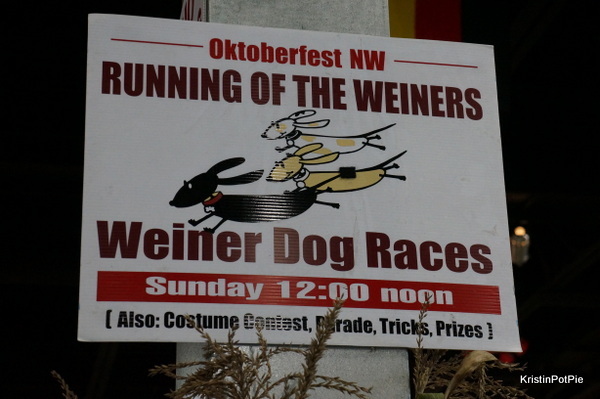 Also back by popular demand this year is the Oktoberfest Northwest Running of the Wieners! Multiple races, costume contests, great fun for the whole family in a stadium atmosphere right inside the heart of the event. This is a Sunday-only attraction. Go here for more details or to register your wiener. Click here for a schedule of events! Don’t forget – admission if free on Friday (today!) 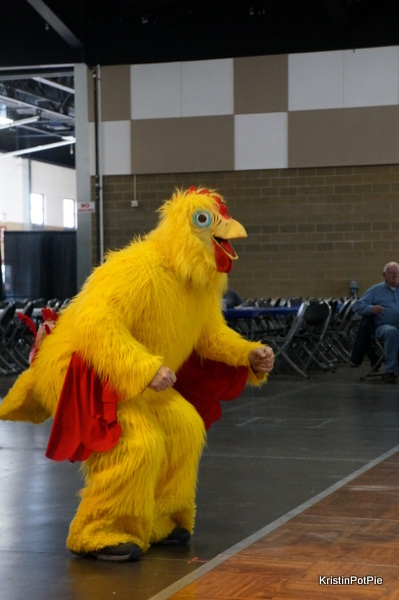 until 3 pm – so hurry down (and maybe we can do the chicken dance together!) See you there! 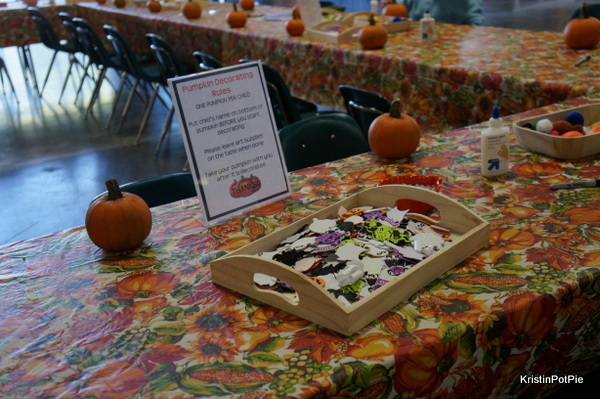 SwopBoard Ski-Attle Event Gives Back to Local Schools! As a PTA and Band parent I have done a lot to participate in school fundraising over the years. I started early – as many parents do. 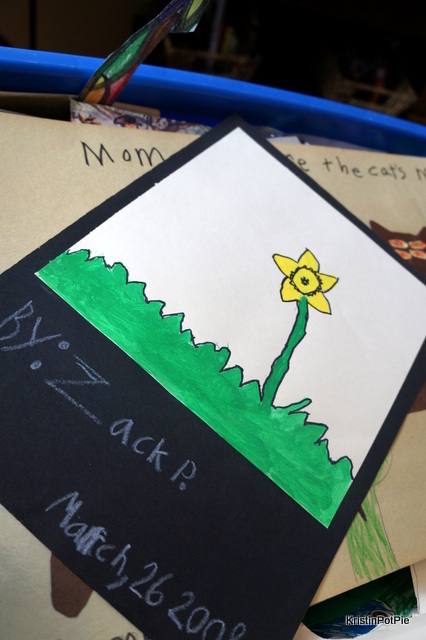 My very first leap into school fundraising was as a freshly minted parent of a Kindergartener. They saw me coming, I guess, and hit me up to run the school auction. Many years, and auctions/raffles/bake sales/pancake breakfasts/wrapping paper, magazine, coupon book sales, later I am a worn out parent fund raiser. As, I know, a lot of you out there also are. Most schools rely heavily on fundraising and many parents just don’t have a lot of time to commit to volunteering. That’s why I am so excited to tell you about this easy new way for communities to raise much needed money for local schools, by doing what you already do – de-cluttering the house! 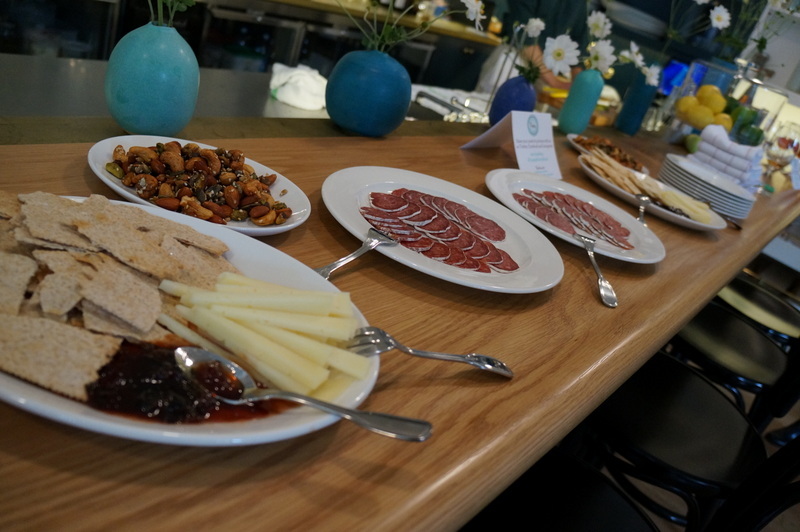 Local start-up pro and power-Mom Natalie Angelillo (co-founder of Seattle’s award-winning Swink Style Bar) is unveiling a visionary look into buying, selling, wanting, and giving back with her all-new company SwopBoard, an online community marketplace. It provides a trusted network for families to buy and sell, with a portion of each transaction going directly to your schools. Angelillo founded SwopBoard in 2013 when she needed to sell a large American Girl dollhouse and buy her son ski boots by the end of the week. She was inspired to build a place where users could put items for sale in front of people who actually need them, in their schools, neighborhoods, and cities and donate to their schools in the process. Now, I know a lot of people in this area are ski families. 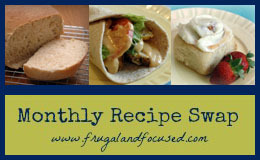 SwopBoard is hosting a special event this month just for you! They are giving users the chance to raise money for their schools by selling and buying much needed winter sports gear. WHAT: With more than 25,000 local families and kids participating in their schools’ winter sports programs, the Ski-attle campaign offers a fast, easy way to sell outgrown winter sporting gear and buy affordable clothes and equipment, with a portion of each sale going toward a school of the seller’s choice. And, as a bonus, every school that gets at least 50 parents to list an item on SwopBoard will be entered to win an extra $1,000. WHO: SwopBoard, a Seattle-based online community marketplace that allows users to sell things they no longer need, buy from people they trust, and give back to their schools. 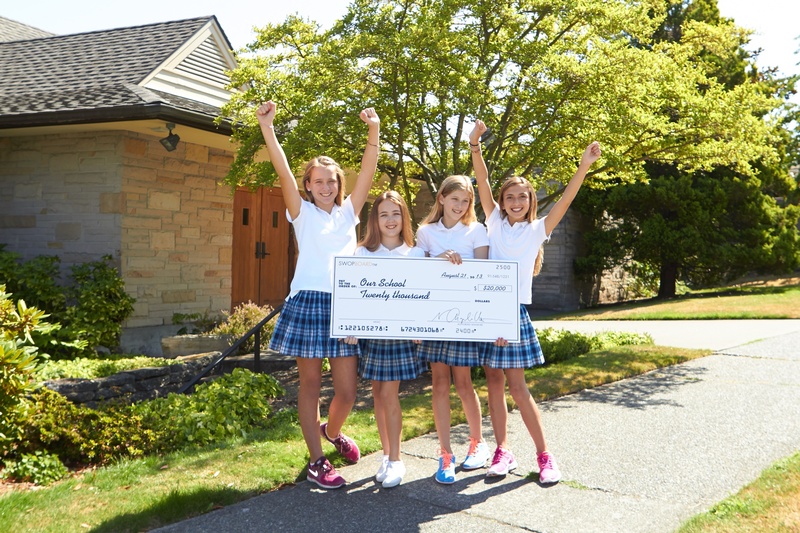 WHY: Families already buy and sell winter gear each year for ski and snowboarding season; SwopBoard and Ski-attle offer a way to raise critical funds for local schools at the same time. 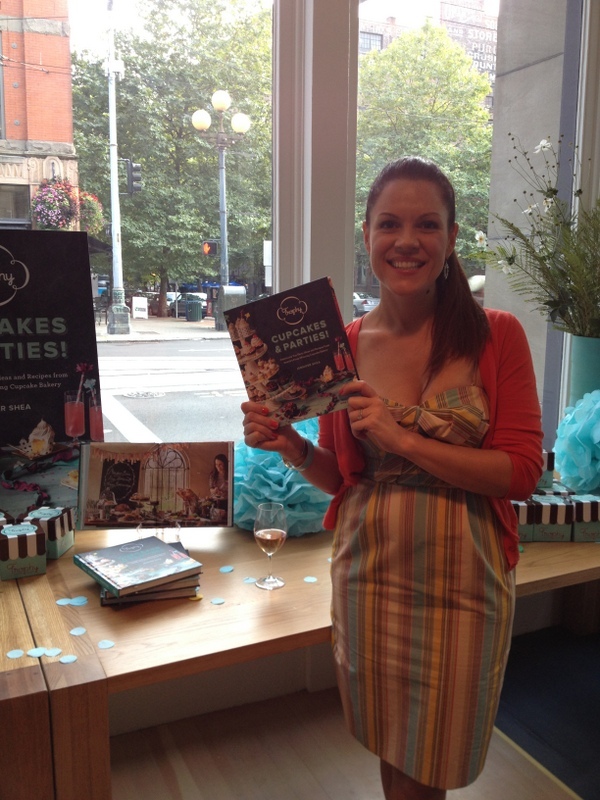 1927, Jennifer Shea, Launch Party, London Plane, Matt Dillon, Narwhal, Party Planning, Trophy Cupcakes & Parties! 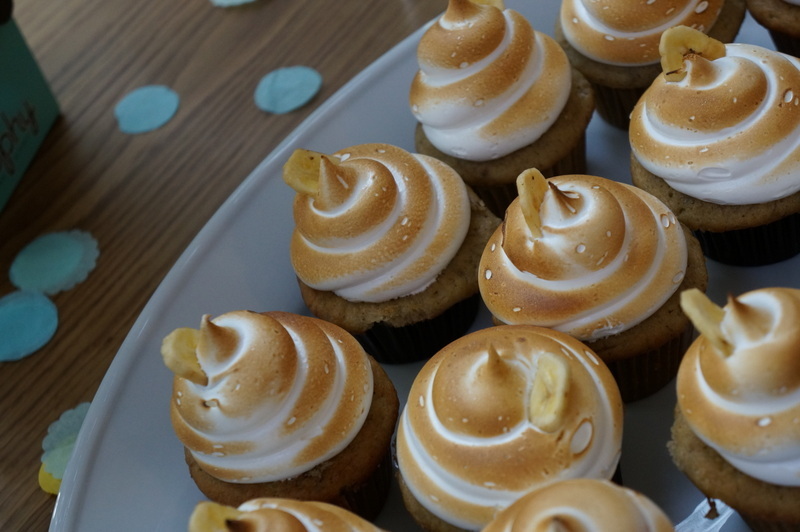 Cupcakes and parties go together like…well, cake and frosting! 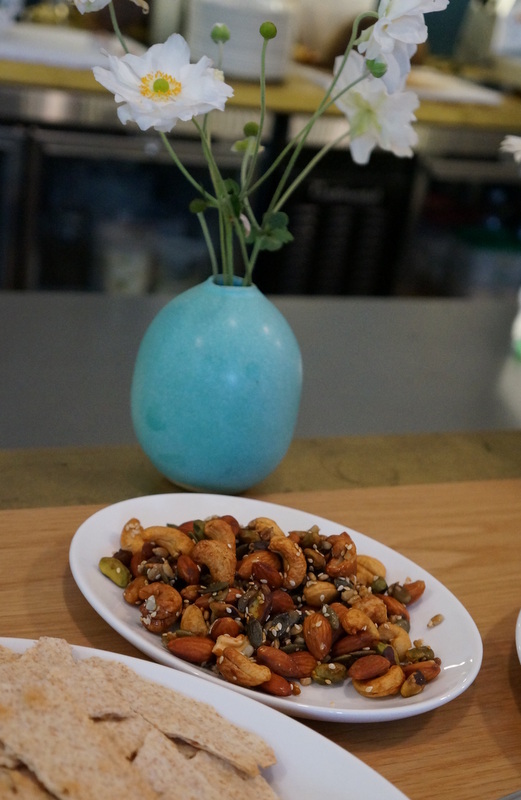 Being a party gal myself, I was thrilled to be invited to a fun little reception, at Chef Matt Dillon’s beautiful new space, London Plane, held last night for bloggers to preview the brand new book from Trophy Cupcakes co-founder, Jennifer Shea. 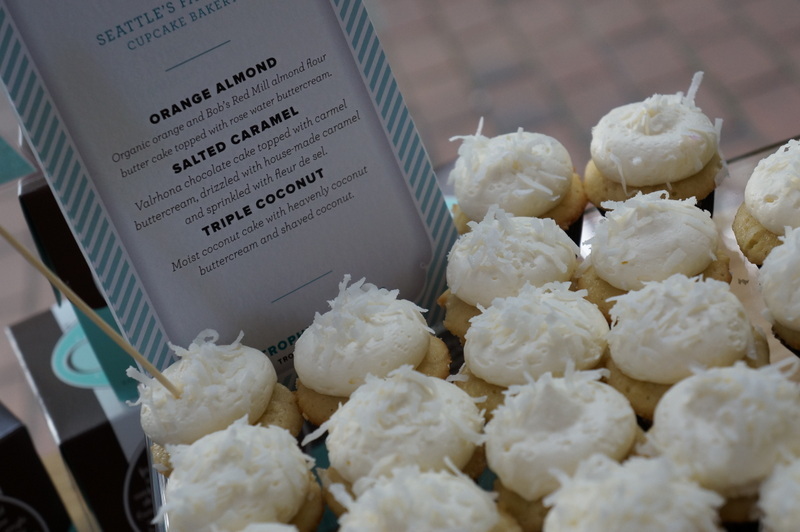 Of course, cupcake flavors from the book were featured at the event. 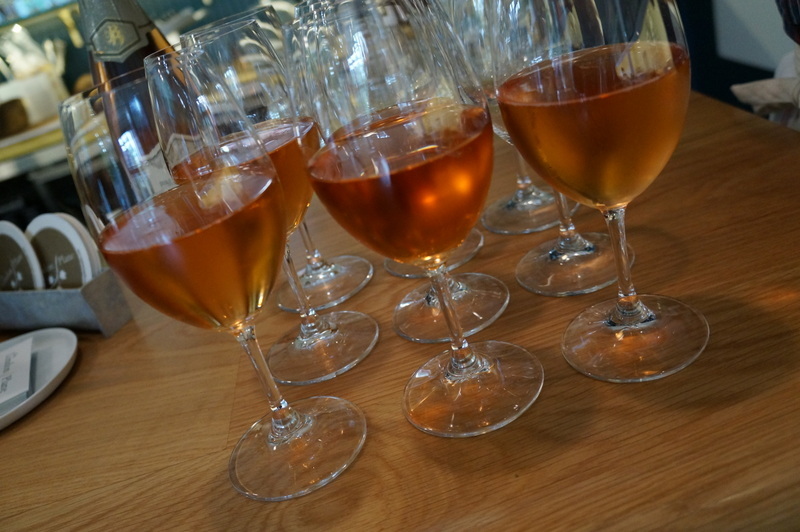 Including the never-before-tasted Trophy flavor created especially for the book – a gluten-free Orange Almond Rose. And we each went home with one of the very celebratory (and gorgeous!) 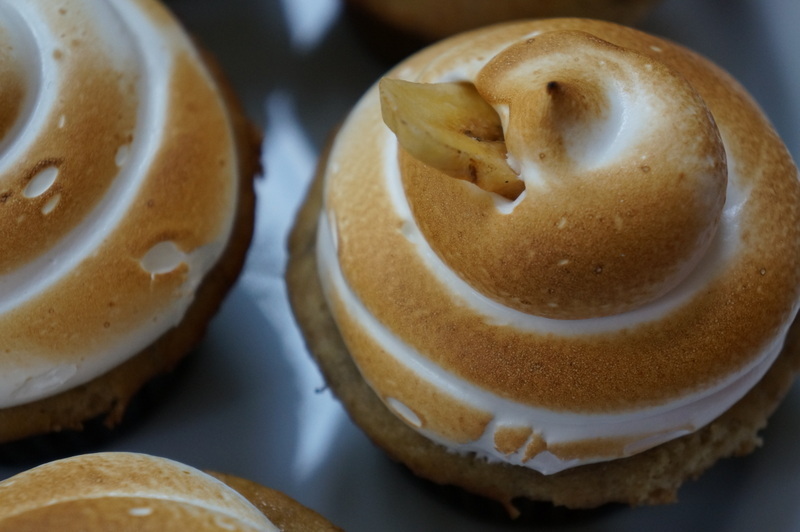 Bananas Foster cupcake! 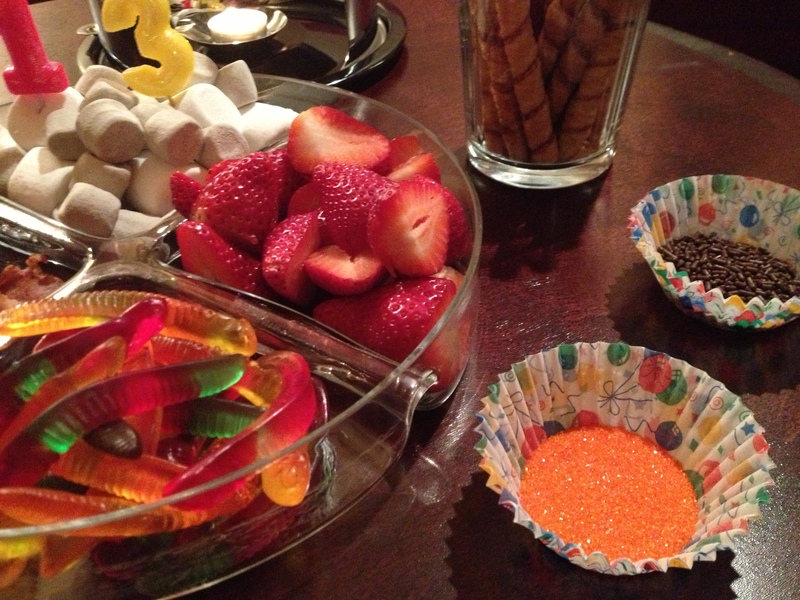 I admitted to this queen of parties that earlier this month, when I threw my son’s big “Neat” 16 party – exhausted from from planning events at my day job and juggling his and his dad’s birthday during the first week of school, I actually gave into the temptation of making cupcakes from a box mix! Oh the shame! I usually only bake from scratch, wanting to really know the ingredients that I am putting into my creations, and understanding that after adding all of the extras (eggs, oil, water, etc.) 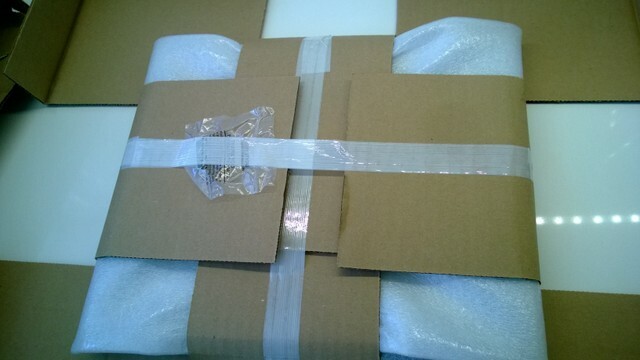 that the box calls for, one would only have to add just a few more items to have home-made goodness. 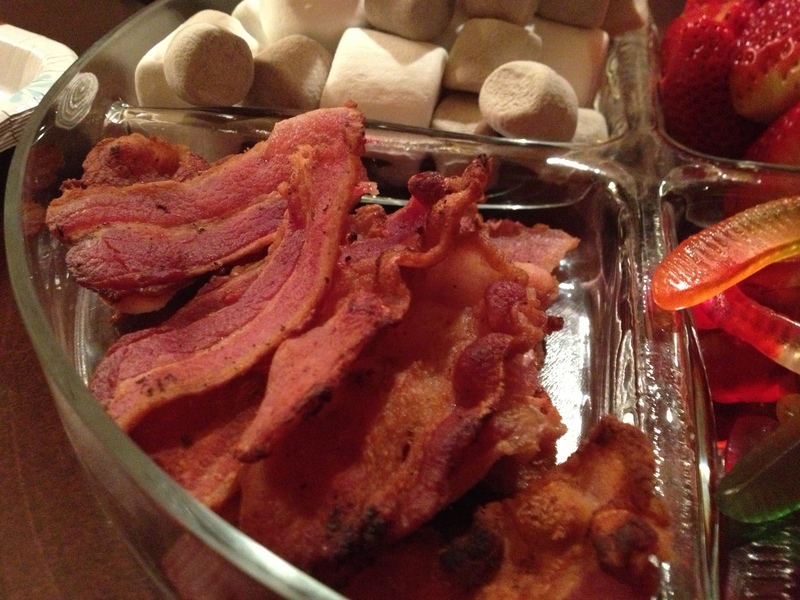 I have a great brownie recipe, Texas sheet cake, coffee cake and many others in my repertoire – but cupcakes? Not so much. Without a go-to recipe (and no time to research one online as I would usually do) I succumbed the night before the party at the grocery store and threw a box into my shopping cart. Now, if I had had this book at the time – I would have been set! 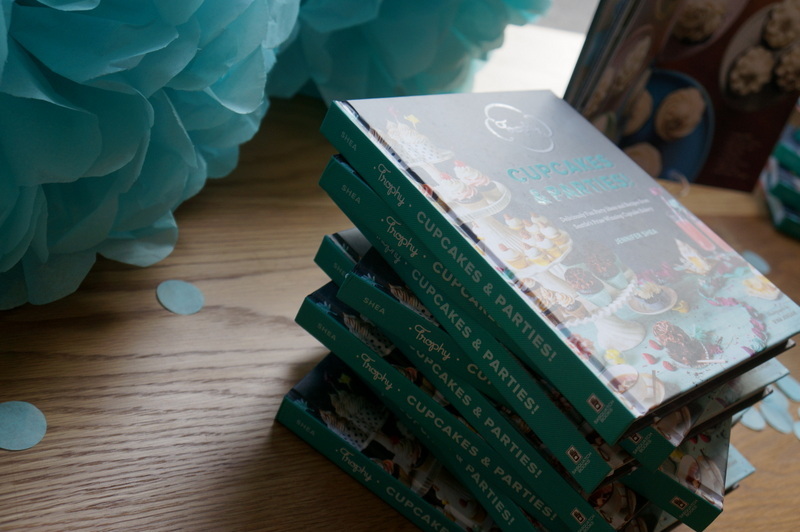 We all get busy, and some of us are more bakers than others, but with this book we can all have the tools to bake a mouthwatering cupcake, and throw a fabulous party! 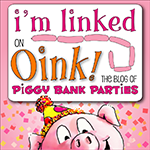 I truly enjoyed the very first look at this exciting new book – filled with delicious recipes, thrilling party themes, planning tools and more – complete with stunning photos by Rina Jordon. 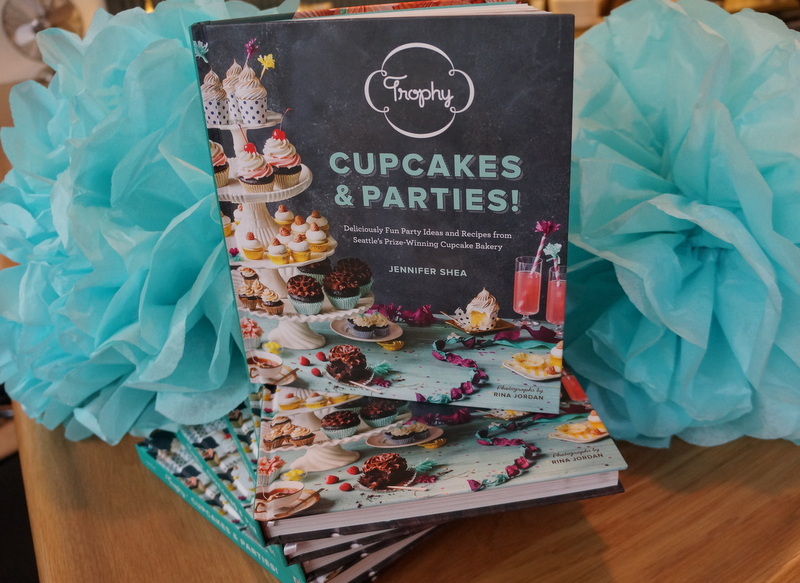 It gives entertainers, bakers and party makers a peek into the magic of Trophy Cupcakes and Party. Now it’s your turn to catch the Trophy party bug! 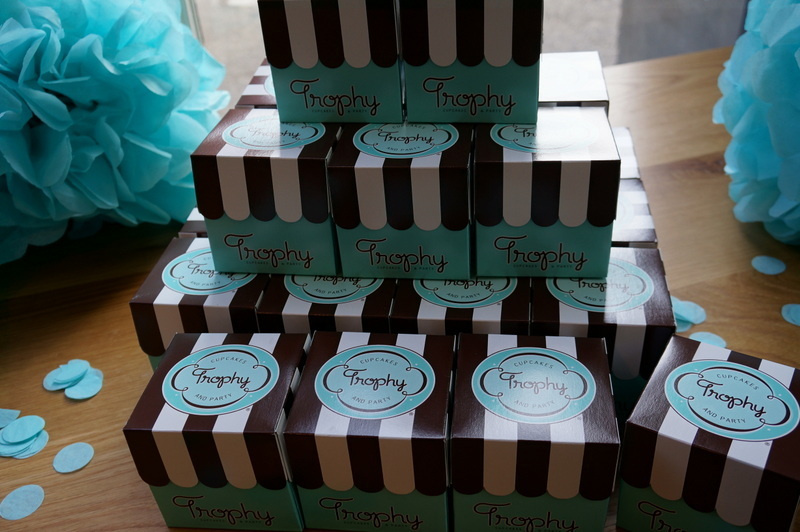 You are invited to a very special evening, as Trophy Cupcakes celebrates the release of Trophy Cupcakes & Parties!. This super decadent, highly anticipated launch party will be filled with all the party panache you’d expect. 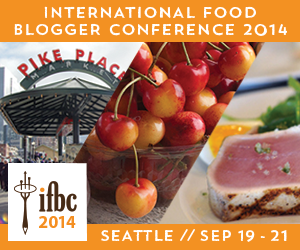 The fun begins at 8 pm on Saturday, September 28 at 1927 Events in Downtown Seattle. Guests will enjoy unlimited Trophy cupcakes (including delectable flavors found only in the book), a “bubble bar” featuring one of Jennifer’s “Top 5 Bubblies” from the book, a cupcake-meets-cotton candy collaboration with Spun Cotton Candy (reason alone to attend), limited-edition Trophy-inspired confections from Theo Chocolate, a sweet collaboration with Simple & Crisp, plus a party snack from Scout Cafe, taken right from the pages of the book! Attendees will enjoy all this and more while dancing to tunes spun by DJ Baby Van Beezly, capturing the moment in the USnaps photo booth and sculpting their very own creation at the “decorate your own cupcake” bar (featuring every topping and topper a cupcake lover could imagine). As an added bonus: Chef Renee Erickson’s 1960 Divco dairy van-turned-food-truck, The Narwhal, will be on site with fried oysters, smoked trout salad, herring rillettes and more available for purchase. A fully stocked cash bar will also be available. Get your tickets fast before they sell out! General Admission Ticket ($35/person): Admission for one to the launch party, complete with a signed copy of Trophy Cupcakes & Parties! 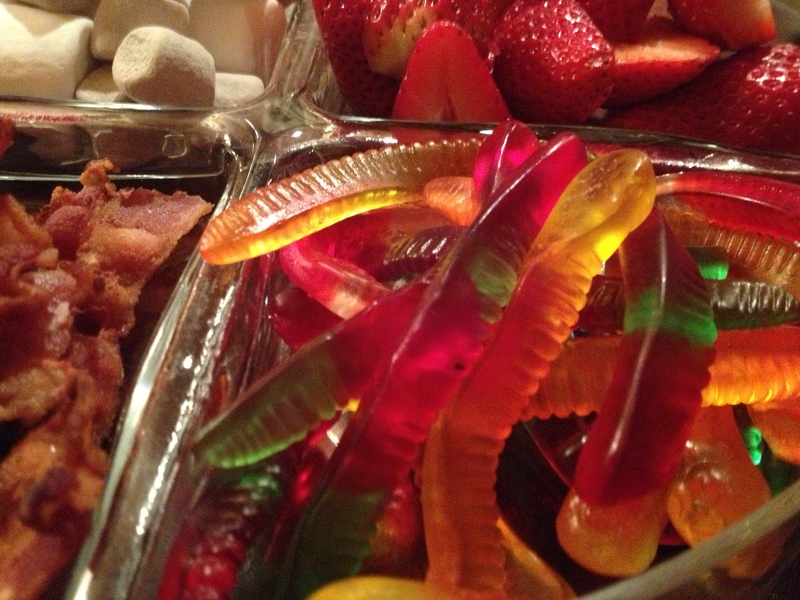 ($25 value), bubbly from the book hand selected by author Jennifer Shea, Trophy cupcakes galore, and additional sweet and savory treats throughout the evening. General Admission Couples Ticket ($45/couple): Bring a friend, significant other or loved one! This ticket gets two people into the party, with one book to share. VIP Ticket ($50/person; limited availability): In addition one book and admission for one to the launch party, VIP guests will enjoy early admission at 7pm to enjoy an oyster bar courtesy of The Narwhal, a signature Trophy cocktail and an exclusive swag bag filled with goodies galore including a limited edition Trophy tote from My Trick Pony, a $10 Trophy gift card, treats from This Charming Candy, Theo Chocolate, Mallow Marshmallows, Simple & Crisp, and more! 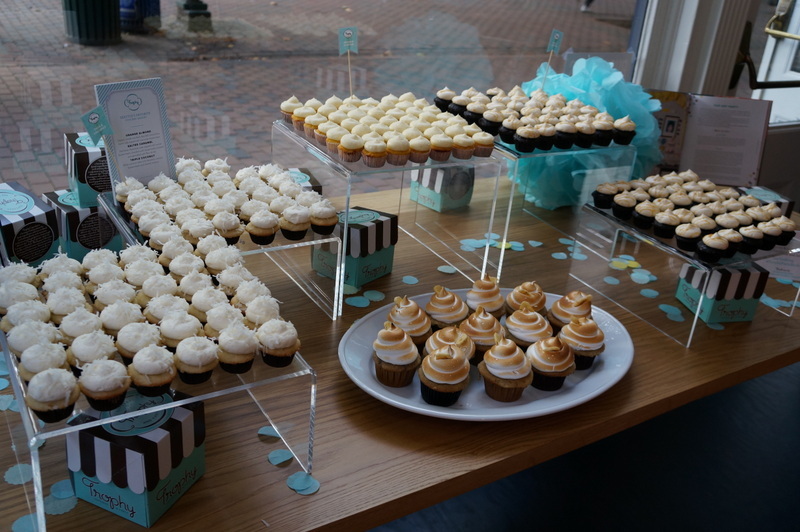 For those unable to attend the launch party, Trophy Cupcakes & Parties! 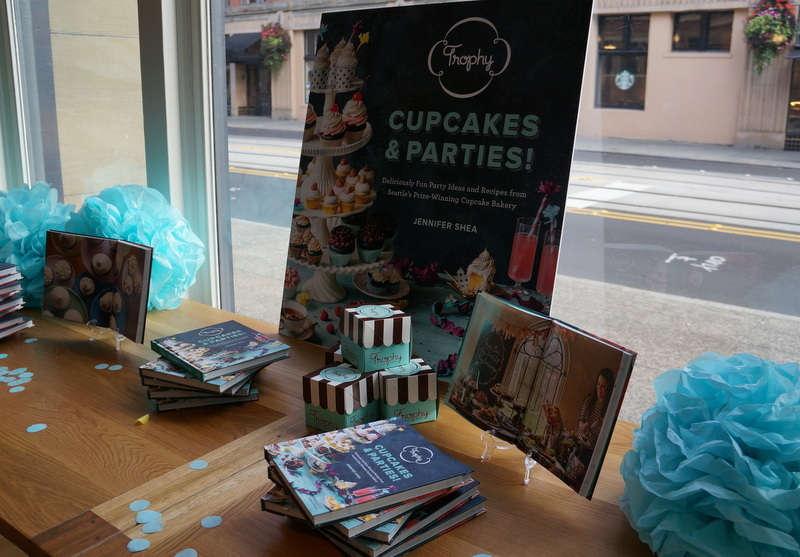 is now available for purchase on TrophyCupcakes.com ($24.95), Trophy’s exciting new book will soon be available at all six Trophy locations. 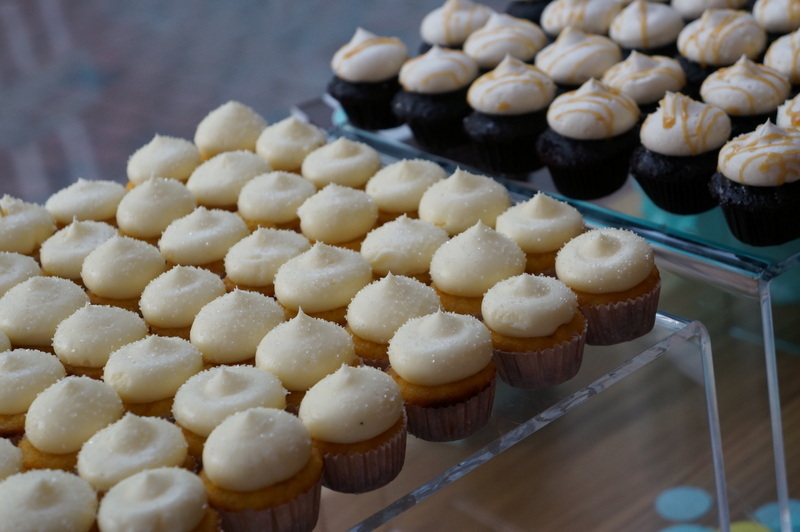 As I have mentioned already (such as in my post about this fantastic cupcake giveaway courtesy of Cupcake Royale here – go enter to win a dozen for yourself!) it is my birthday on Saturday. I know. I know. 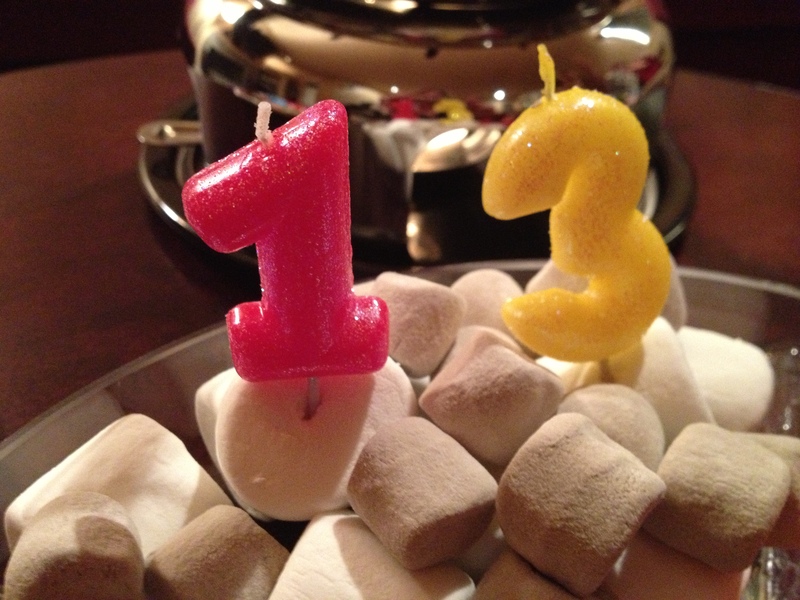 You are probably getting tired of hearing about my birthday. But today I want to tell you about a very special fundraiser that I will be attending to celebrate the day. One of my favorite things to do on my birthday is to give back, so when I read about this event I knew the plans for my special day were set! I am hoping you will join me in supporting this wonderful organization that brings birthday celebrations to kids who otherwise might not get one. 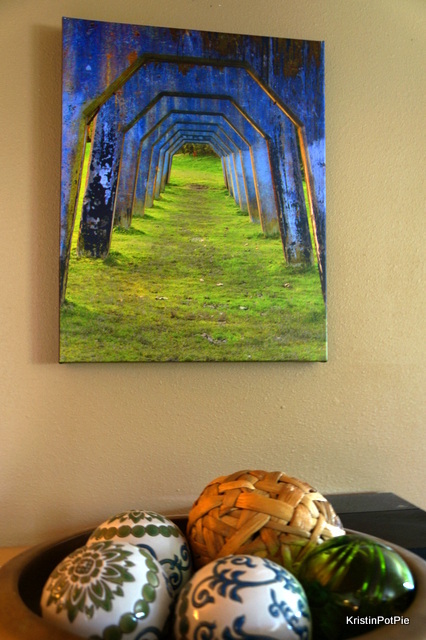 Birthday Dreams is a non-profit organization dedicated to providing birthday parties to homeless children and foster children living in group homes all over the Puget Sound. Every child deserves a birthday! 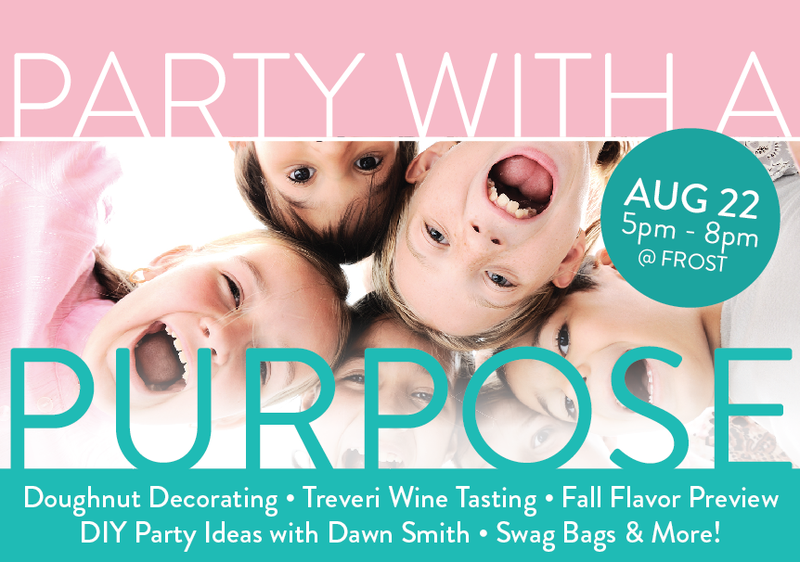 On Saturday, August 17 from 11 am – 2 pm, PlaceFull (a business that helps you discover 100’s of event and party listings and book online) and Birthday Dreams are joining forces to host a gigantic birthday party at Skymania Trampolines in Kirkland complete with yummy eats, lots of trampoline fun, and, of course, CAKE! Plus, they’re inviting kids from area homeless shelters for a free day of jumping that promises to be filled with smiles. With your donation of just $15 per kid, your family can come join mine, and jump for 90 minutes while taking part in all the festivities! The best part is that 100% of your donation will go to benefit Birthday Dreams and support them in their mission of giving EVERY kid a Happy Birthday! To purchase tickets to this fantastic event click here. This spring I was honored to participate in this amazing local fundraiser to support finding a cure for pediatric cancer. 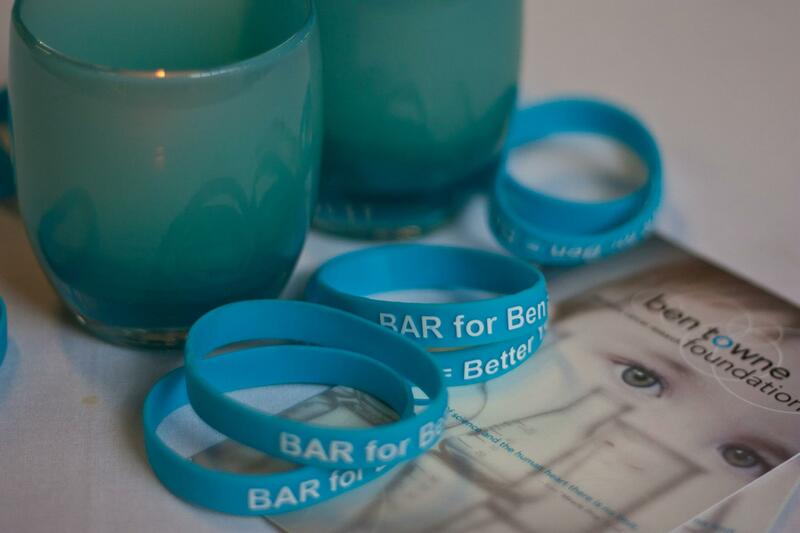 I wrote here about starting my 60 day challenge at the Seattle Eastside Bar Method, and its beneficiary, the Ben Towne Foundation, who work in conjunction with Seattle Children’s Research Institute in the field of childhood cancer research. With the challenge all wrapped up, I am very proud to announce that I was able to meet my goal and complete 24 classes! Yeah me! 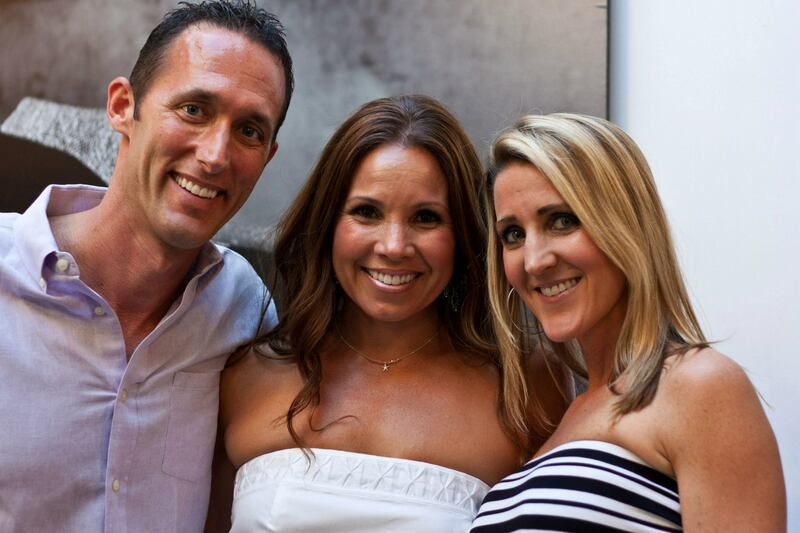 But even better – during the two months of the challenge, the Bar Method had 275 people take 24+ classes and 50 people take 42+ classes, so they were able to donate an incredible $4,000 to Ben Towne Foundation. 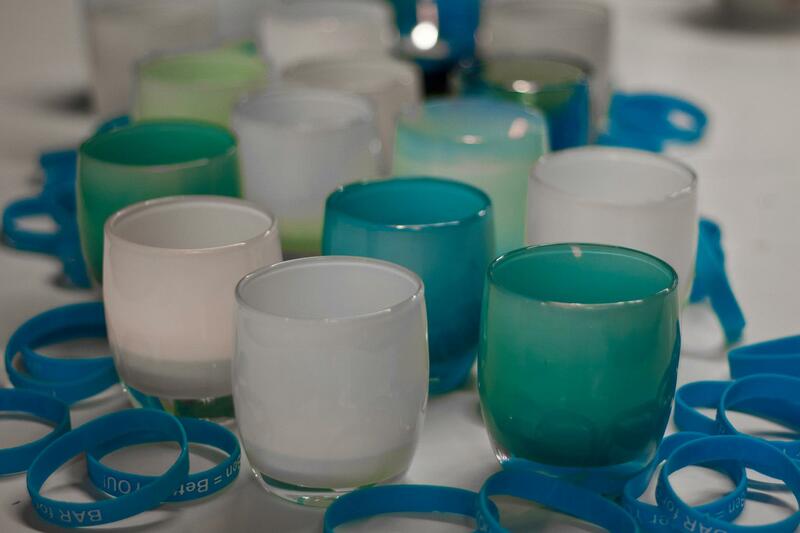 The Challenge culminated last month in a fabulous celebration party at Seattle’s Glassybaby studio, where 10% of the glassybaby sales that night were added to this total. 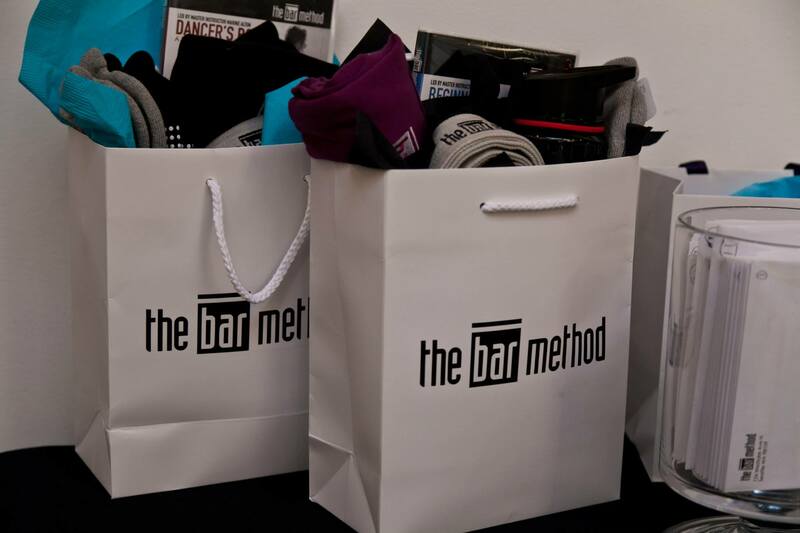 The Glassybaby event raised an additional $500, bringing the grand total to $4500 from Bar Method this year! Last year they had two fitness challenges benefiting Ben Towne Foundation – and with this year’s Challenge, the total amount of money that Bar Method has been able to donate, over the last two years, to Ben Towne Foundation, is more than $8,650!!!!! This experience was also an amazing journey for me personally. In completing my 24 classes, I lost one pant size and five pounds, my posture greatly improved and I slept so much better than I had in years. I also learned to let go. You see, some of you may know this about me, but I am a little bit of a control freak. And the most impactful thing that working out at the bar taught me, was that my body holds onto all of that. I walked into that first class determined to be able to get into every pose and hold them, just as the others in the class were doing – but it was a rude awakening when my body had other ideas! Eventually, with encouragement from the ever-patient instructors, as I stopped thinking so much about it all, and trying to be perfect, the body relaxed and I found I was able to do so much more than I ever could have imagined. Thank you so much to owners, Luke, Bev and Maika, for this opportunity to give back to a cause I believe in – and to be able to learn about myself and improve my health in the most safe and welcoming environment. This is no ordinary gym. They have created a beautiful, caring community where life’s special moments, like new marriages and babies being born to members, are celebrated by all, and where comfort is offered in sad times. I cannot tell you how much it meant to me that when Maika heard my grandmother had passed away, she came over to me, as I was entering class, just to put her hand on my shoulder and tell me how very sorry she was to hear about my loss. This is a very special place indeed. Have you taken your Christmas tree down yet? I always get sort of sad when it’s time to take it down so we usually leave ours up until at least New Year’s Day. But this year I was torn. I was sort of ready to get things tidied up early, but not really ready to say goodbye to the beauty of the lights twinkling on the tree. So I decided to do something I haven’t done in many years. I got a head start putting the ornaments away while still making it possible to enjoy my tree for a few more days. Take all those NYE party hats and blowers off your table, and the banner and balloons you have been trying to find a spot to hang, and simply add them to your tree! 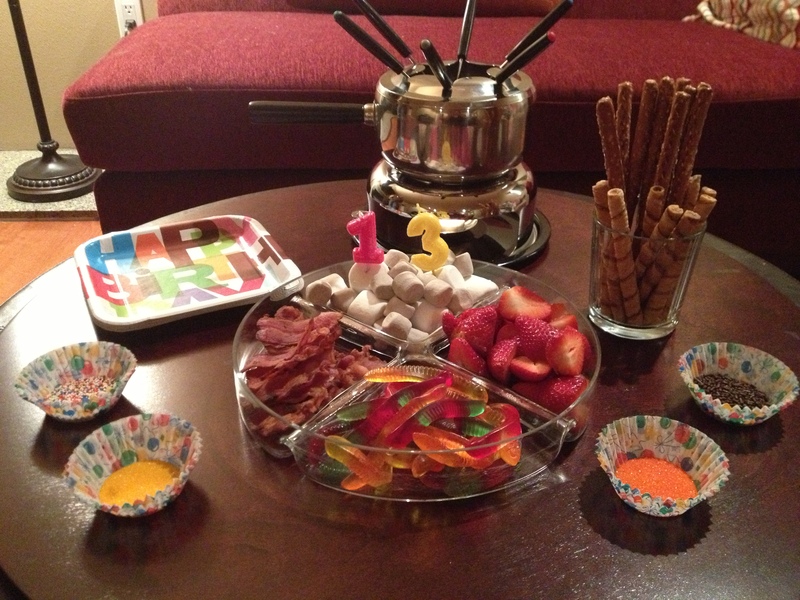 This is a great way to present your party accoutrements, and so fun for the kids to help with! As guests arrive (or close to midnight), have them choose a party hat and blower right off the tree. You can leave your ornaments on if you like and just add to it, but I chose to take all the special ornaments off to make some room for the balloons. I did leave the plain colored balls and the lights on though because I liked how the colors (and the lights) added to the look. The “Happy New Year” banner is attached to branches with ornament hooks and then I just loaded the tree with hats and party blowers. Use as much or as little as you like. 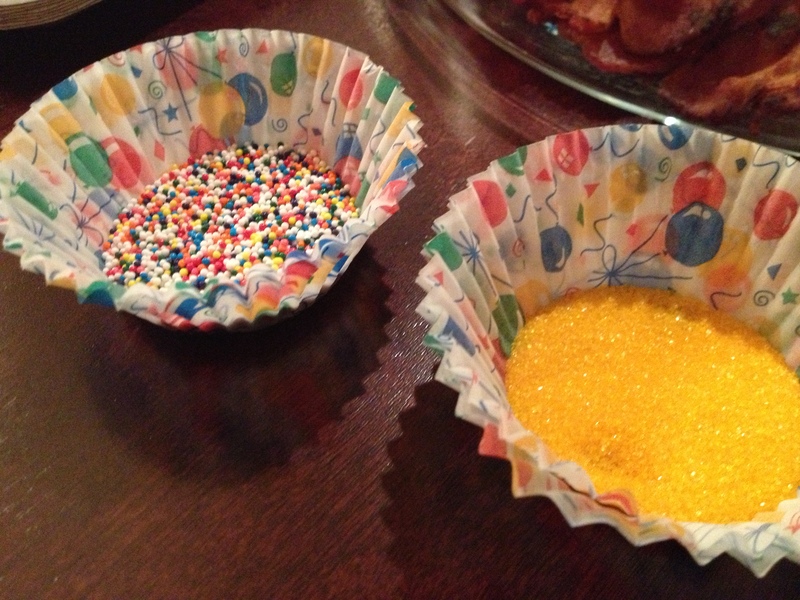 It would be cute to add little treat bags for party favors, wouldn’t it? 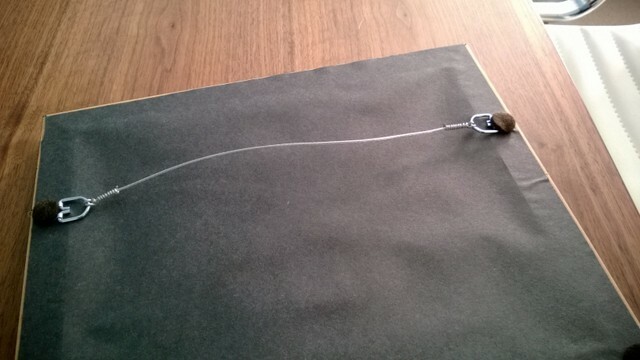 I made it work – I just filled up each balloon with a varying amount of air to make them differ in size. The balloons may waft off the tree as the evening wears on, but that just adds to the festive feel of the event as they float through the space. In fact, if you don’t have little ones or pets about, you can even blow up a bunch of extra balloons and surround the tree with them – intentionally adding a bit more of a party atmosphere. Our tree is ready for a celebration! 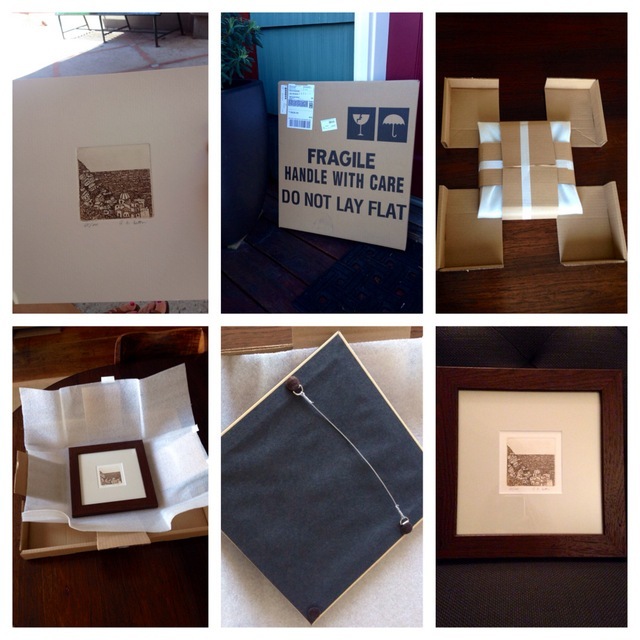 I know many people have different traditions surrounding the taking down of the tree – When do you pack yours in? Do you leave it up through New Year’s like we do, or are you a “get-it-all-cleaned-up-immediately-after-Christmas” type? I would love to hear what your traditions are. Wishing all of you a fun and safe New Year’s! Bring on 2013! “My Macy’s Holiday Parade & Star Lighting” Kicks off the Holidays! 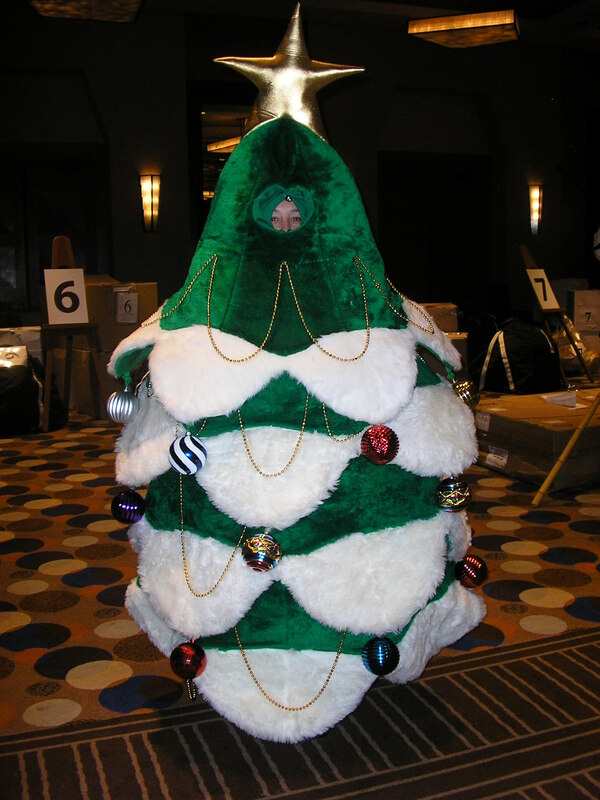 There I am last year in the Macy’s Holiday Tree costume! As I roll into Thanksgiving week and finish my last-minute preparations, I am allowing my mind to turn to the next celebration just around the corner. That’s right! Christmas! I love Thanksgiving for what it is but also for being the kick-off to the holiday season. This weekend will be filled with family, leftovers (turkey soup – yes! ), shopping, decorating and the beginning of the most magical time of the year. If you are in the Seattle area you won’t want to miss the My Macy’s Holiday Parade and Star Lighting to help your family kick-off the holidays! In celebration of the 2012 holiday season, Macy’s annual My Macy’s Holiday Parade will take place on Friday, November 23, 2012 in downtown Seattle. The parade features 25 inflatable floats, local middle and high school marching bands, over 600 costumed characters, professional sports teams and community drill teams. This year’s Parade will also include two new helium star balloons escorting Santa’s sleigh. The parade starts promptly at 9 a.m. and lasts approximately one hour. The Holiday Parade route, shown below, will begin at 7th and Pine, then travel west down Pine Street to 5th Avenue, south on 5th Avenue to University Street, west on University to 4th, and then north on 4th to Macy’s doorstep. The parade ends as Santa dashes in his sleigh past Macy’s, heading directly from the North Pole to his Seattle holiday post in Macy’s Santaland on the 6th floor, which opens at 11:00 AM. Santaland is open from November 23 through December 24 where Macy’s will once again offer an assortment of digital photography packages. Santa photos will be available every day from Friday, November 23 through Monday, December 24. For more information visit www.macys.com/holidayevents for Santaland daily hours. Later that evening, Macy’s will continue the celebration with the Holiday Star Lighting Ceremony in conjunction with the annual Seattle Westlake Center tree lighting. 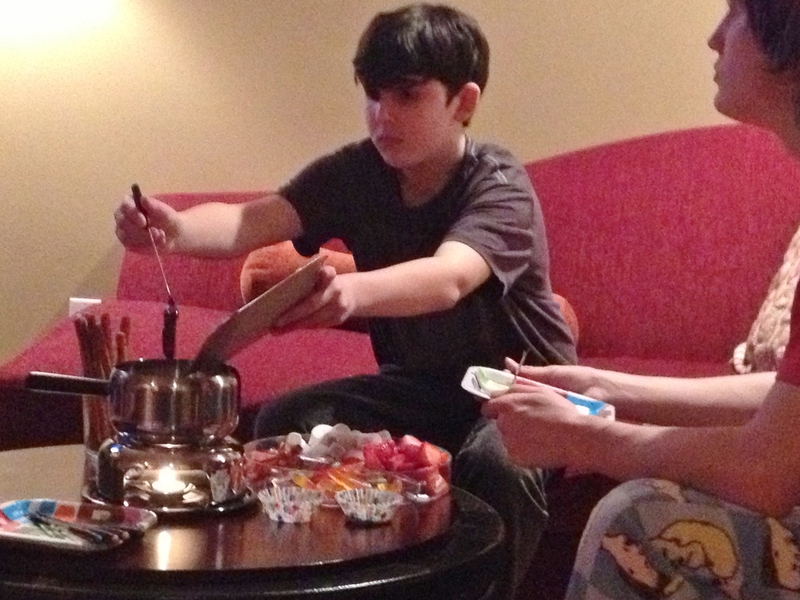 I have such fond memories of this tradition from when the boys were little – a bit of shopping followed by a hot cocoa as we waited so patiently (or not so, as in the case of little boys!) for Santa to make his appearance to light up Downtown Seattle with holiday cheer! Ah the looks on their little faces! This event begins at 5 p.m. and will include an incredible fireworks display (weather permitting) and the lighting of the famous 161-foot high, 3,600-bulb Holiday Star which is a Seattle favorite. Macy’s is also once again hosting the holiday “BELIEVE” Campaign to benefit MAKE-A-WISH FOUNDATION this year. Beginning November 2 and running through December 24, believers of all ages are invited to drop off letters – stamped and addresses to Santa at the North Pole – at any Santa Mail letterbox at your local Macy’s store. 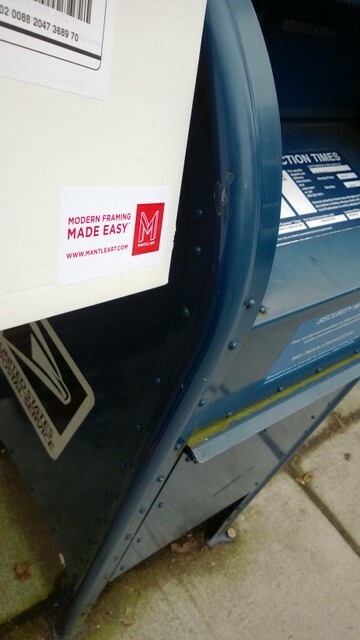 For each letter received, Macy’s will donate $1 to the Make-A-Wish Foundation, up to $1 million, to grant wishes to local children with life-threatening medical conditions. For more information, visit www.macys.com/holidayevents. 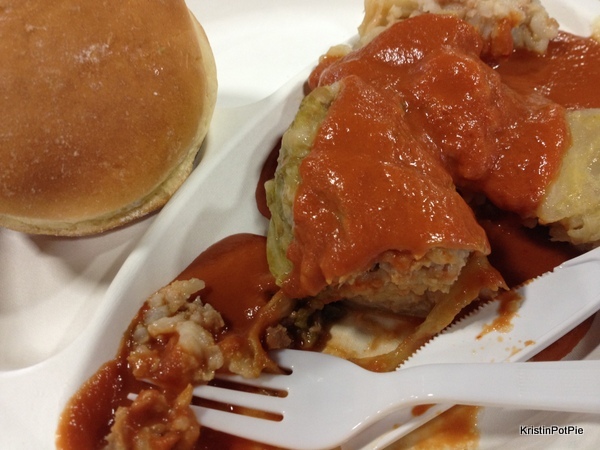 What is your favorite tradition to help kick-off the holidays?